It has been over a month since we were last treated to a DROID RAZR HD sighting. Thanks to leaks out of China, we were able to take a peak at a device that was once codenamed the “Fighter” that looked a heck of a lot like previous RAZR releases. Well, except for the HD screen and on-screen soft keys. 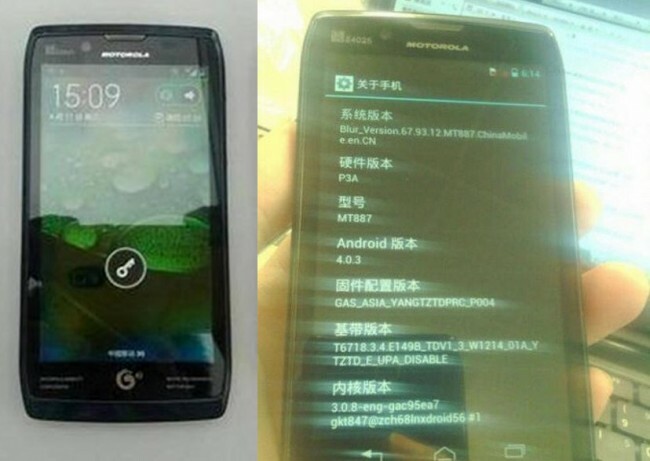 Thanks to China again this morning, we have pictures of a similar device with model number MT887 which is almost identical to what we will see here in the U.S. The device has that same HD screen and on-screen keys along with Ice Cream Sandwich. If you were wondering how Motorola would do the on-screen soft keys deal, this would be it. Thankfully they did not take the Samsung approach and change the order of them. What else do we know about the RAZR HD? Along with the HD screen, we will likely also see a dual-core Snapdragon S4 chip inside clocked at 1.5GHz, 12 or 13MP camera, 3300mAh battery from the MAXX, and 4G LTE. And yes, I agree with what you are about to type – this should have been the original RAZR from day 1. We didn’t need 3 or 4 renditions before we got here. Galaxy SIII Pops Up on German Amazon Site, Should We Believe It Though? Sprint Galaxy Nexus Orders Arrive Early, Device Running Android 4.0.4 - Ummm, Hello Verizon and Google?